Following years of increased hurricane activity, the blizzards of winter 2010, and the foiled terrorist threat in Times Square, concerns over an overburdened or failed terrestrial communications network resurfaced, and in some cases, these fears became a reality. The potential and actual lack of operable terrestrial communications resulting from these situations could severely impede disaster relief and recovery efforts of first responders and government officials. With these threats looming, satellite communications has increasingly become part of the response plan to fill the communications gap. Success in emergency relief and disaster recovery is measured by quick response times and the ability to establish real-time connectivity. With ubiquitous coverage, satellite communications networks can provide the backbone for rescue and support initiatives during times of crisis and offer first response, medical and emergency teams with full communications capabilities. When cellular communications networks are compromised, satellite communication is often the only available communications option. 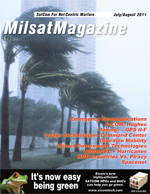 In fact, in many of the affected areas following a natural or manmade disaster such as areas impacted by hurricane Katrina in 2005, satellites proved to be the only source of communications in the days and weeks following, and provided the basic operability that terrestrial networks could not. Satellites are the most reliable platform for communications in disaster situations as they are unaffected by land-based issues, where damage to ground equipment can be widespread following a catastrophe. Satellites provide redundancy and communications path diversity while ensuring that first responders and disaster recovery teams are able to coordinate in any emergency situation. As a result of this reliability, satellites allow public safety officials to communicate their needs and provide information to families, communities, governments, and the general public. It is, therefore, critical that first responders have the instant communications infrastructure and ubiquitous coverage that only satellites provide. Whats more, first responders cannot rely solely on satellite voice communications when relaying information to and from the field and command center, but must also have access to data communications to provide vital information that can save lives. TerreStar Networks recently launched the worlds first mobile device that integrates both traditional cellular features (provided by AT&Ts cellular network) as well as a non-terrestrial based communications platform. The TerreStar GENUS is a unique and important tool for public safety officials and first responders that augments terrestrial infrastructures, which themselves are susceptible to all types of natural and manmade catastrophes. Designed to be used as an everyday device, the GENUS is a dual-mode satellite-cellular smartphone. With just one number for voice, data, and messaging, the GENUS provides 3G cellular wireless connectivity integrated with an all-IP satellite network offering coverage throughout the United States, Canada, Puerto Rico, U.S. Virgin Islands and in territorial waters up to 200 miles offshore. It is the first and only device operable on both terrestrial and satellite networks that delivers always on communications for first responders, public safety officials and law enforcement officers. The GENUS offers a QWERTY keyboard, touchscreen and runs on the Windows Mobile 6.5 operating system. Users can make voice calls, send text messages and check email on one device with one phone number for both satellite and cellular service. Offering one phone number with one contact list alleviates the need to search for numbers and contacts, which is especially important when in disaster mode. The GENUS includes other standard smartphone features that can be critical to emergency response and disaster recovery teams, including a 2.0 megapixel camera, MicroSD slot, WiFi, Bluetooth and GPS. Finally, TerreStars revolutionary spot beam technology, coupled with Ground Based Beam Forming (GBBF), allows TerreStar to allocate power and spectrum to situation-specific incidents ensuring capacity when and where it is needed. With the integrated cellular/satellite communications solution enabled by the TerreStar GENUS, emergency and disaster response personnel no longer have to reach for the clunky traditional satellite phone in storage when disaster strikes. Instead, they can gain access to ubiquitous wireless coverage through a robust and flexible communications platform with the ease and full functionality of a state-of-the-art smartphone that they carry on a daily basis. Mr. Matheson is responsible for TerreStars corporate planning and drives the technical direction and delivery for development of the satellite and network systems and handset technologies for TerreStar Networks. Prior to joining TerreStar, Mr. Matheson was the Senior Vice President and Chief Technical Officer for Motient, providing the technical direction for all services. His responsibilities included the ground station development and satellite operations for the L-band spectrum. Mr. Matheson previously was the Senior Manager of Systems Architecture for Bell Northern Research, a subsidiary of Northern Telecom and a leading provider of telecommunications equipment for both wireless and wireline applications.